A la Carte: From Lee With Love — Thanksgiving Recipes Galore! You are here: Home / Towns / Lyme / A la Carte: From Lee With Love — Thanksgiving Recipes Galore! Editor’s Note: We are running three of Lee White’s wonderful columns together today to give readers a chance to savor a selection of her wonderful Thanksgiving recipes in one place. Happy Thanksgiving to all! For more years than I can remember, I have been writing about turkey at Thanksgiving. I get every food magazine every month and every single month, in October, a turkey is on the covers. My mother never cooked a turkey. We had Thanksgiving at an aunt and uncle’s home in Kinderhook, New York. There was no gravy and no stuffing and the sweet potatoes were stuffed into oranges, which made the sweet potatoes taste like oranges. 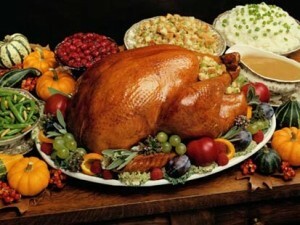 The first Thanksgiving with my husband and daughter was in Houston, and I ordered turkey and sides from a restaurant. The gravy was white. In following years I made turkey and sides it myself, sometimes on 20 or more friends and family. The first few times, I called the Butterball Hot Line for help. Some years later I stopped using the throwaway aluminum pans and bought a $200 roasting pan, which I still use for every kind of roast I have ever made. It was one terrific buy. Over the years I brined turkey in a huge cooler. I bought organic turkeys. Last year I went to a friend who made a heritage turkey. I made all kinds of stuffing and once placed slices of bacon on top of the fowl. A few times I put buttered cheesecloth on the turkey. But these days I buy the least expensive turkey I can get and I buy it frozen. I make my stuffing the night before and put it in the refrigerator in an enormous plastic bag. The next morning I stuff as much dressing as possible into the thawed (but cold) turkey’s cavity. I put the rest in a casserole and when the roasted turkey come out of the oven, I add some juice to the casserole and bake it. Forget all those other “new” ways to make turkey for Thanksgiving. Here is my favorite recipe. Remove giblets from turkey (I don’t use them; instead, I boiled them for the kitties, less bones). Rinse and dry turkey inside and out. Rub salt inside cavity of bird. Fill cavity with cold stuffing made the night before or early morning. Place bird in a rack (or upside glass pie pan) atop a large, heavy-duty roasting pan. Place in a 350-degree oven. Add butter and wine in a saucepan, bring to a boil, then simmer for about 10 to 15 minutes. Open oven, pour wine-butter over turkey and close oven. Every half hour baste liquid over turkey. Bake until turkey is done (when the thermometer plunged into the thickest part of the thigh registered 175 to 180 degrees, 10 to 12 minutes per pound if not stuffed or 12 to 15 minutes stuffed). Remove grease from roasting pan. and place the pan on the stove. Turn heat to medium. In a large jar, add all-purpose flour and about 2 cups of water. Screw jar cover and shake. When the brown bits are hot, add flour-water mixture and, over medium-high heat, whisk constantly. If you need more water, add some. Once the gravy is ready, add and stir in Gravy Master to taste (optional). Add salt and pepper to taste. Cranberry, grape and apple sauce. This was a very busy but very pleasant week. First was a lovely party for the retirement of Betty Anne Reiter at the Mystic Museum of Art. Betty Anne and I have worked together for quite a few years, she as librarian at the Groton Public Library, creating a couple of food series at the library. She and her staff made the series such fun that I hope we will do it every May. Then there was cookbook time. Rose Levy Birnbaum, food writer extraordinaire, was on a book tour with her newest ???????? and we had a nice lunch at Olio before she and her assistant, Woody, went to their next signing and demo in Paramus, New Jersey. A few days later,, I went to RJ Julia in Madison to listen to Dorie Greenspan (who has a house on our shoreline), talk about her newest book, Everyday Dorie. I think this may be the best of her many best cookbooks and one of the best I have read by anyone in the last five years. I had dinner that night with Madison friends at Elizabeth’s, a new one for me. The food was delicious, the service very professional and , service just lovely. If the chef will share a recipe with me, I will share the house made gnocchi in a Gorgonzola cream sauce topped with frizzled onions. Four of us shared that appetizers, and then we ordered another. But I digress. I will have Thanksgiving with family in Newburyport and then drive back to Connecticut have another turkey dinner the next day in Durham. For the one with my family, I will make the turkey stuffing and a new side, so here is an old and a new; none is blue but one is borrowed. Preheat oven to 325 degrees. Lightly coat a rimmed baking sheet with spray. Place grapes, apple and shallot on prepared baking sheet and lightly coat with cooking spray. Bake until shallots begin to soften, about 5 minutes. Add cranberries to baking sheet. Bake at 425 degrees until cranberries burst, apple is tender and grape skins are beginning to burst, about 20 more minutes. Remove from oven and transfer mixture to a medium bowl. Stir in butter, maple syrup and salt. Cool completely, about one hour. Sprinkle with thyme, if desired. I make the stuffing at least the day ahead,, because it should be cold when you put it in the turkey, which is also cold. This is probably more stuffing you will use. You can put the rest in a casserole and bake for Thanksgiving, or freeze it for another turkey or chicken dinner. Make Pepperidge Farms stuffing according to package instructions. A couple of weeks ago, I flew to Pittsburgh to see my brother. Now, for those of you readers who are men, don’t send me letters and say I am not correct when I say that widows learn how to take care of themselves, but widowers are often reattached in weeks or months. My sister-in-law died in March of 2018, the memorial service was in April and a few months ago my brother mentioned that he wanted me to meet Lois. As I walked down the Pittsburgh airline’s escalator, I saw them holding hands. And I am here to tell you that my brother has found, very simply, the nicest person I have ever met. In addition, she is around his age (he is 83) and they met playing duplicate bridge. Anyway, I had a wonderful few days. One evening we had dinner at an inn where we shared oil-truffled French fries with a ramekin of srirachi. My entree was a small pork tenderloin with mashed potato side so delicious I had to ask what was in it: the sous chef said it was maple syrup and chipotle. The second night, Lois’s three daughters and their husbands brought pot-luck to my brother’s house and called it a party. Lois’s daughters are as nice as she is, as are their husbands, although one of them showed me a picture of a 10-point buck he’d killed that afternoon. Now I am home and the holidays have begun. For the past two columns, I gave you my recipes for turkey, gravy, stuffing and a new cranberry sauce. Although pies are de rigueur, why not make a lovely autumn cake and, if you have some extra, make a trifle? I will be driving to Newburyport, Mass., for the day, but feel free to e-mail me if you run into problems. And my next column will include recipes for turkey leftovers. Preheat oven to 350 degrees. Grease a 10-inch tube pan. Preheat oven to 350º F. Grease a 10-inch tube pan. Cream butter and sugar until light and fluffy. Beat in eggs, one at a time, blending well after each addition. Whisk together flour, baking soda, cinnamon, cloves, ginger and salt. Stir dry ingredients into egg mixture alternately with milk, beginning and ending with dry ingredients. Pour batter into prepared tube pan. Set on the middle rack of the oven and bake for 1 hour and 5 minutes, or until cake pulls away from sides of pan and a tester inserted in the center comes out clean. Cool cake in the pan, set on a rack, for 10 minutes. Remove cake from pan and spread on icing at once, while cake is still warm. Love reading Lee White’s stories! Thanks for all the good ideas! Sounds like you’re having a wonderful Thanksgiving week!